The pace of change and demand for innovation are accelerating such that it is no longer sufficient for us to strive to simply do more. We all have goals we want to reach where attainment seems out of reach. To succeed, we need to get better at getting better. Immunity to Change mapping is a potent tool that can help us build infrastructure within our minds that enables us to thrive amidst the challenges of changing modern world. In this class you will learn why determination and will power are often not sufficient to achieving your goals. You will uncover hidden forces that work against your best efforts and get tools for addressing these forces so that you can make the changes you want to make by working smarter, not trying harder. The Immunity to Change (ITC) method for achieving personal and professional goals was developed by Harvard professors and best-selling authors Bob Kegan and Lisa Lahey and has been used by thousands of people from all walks of life to make meaningful and sustained changes. In this course you will choose a goal you have been trying to achieve and complete your immunity to change map to see what forces are keeping you from that goal and how to overcome the barriers and reach the outcome you want. “Immunity to Change: How to Overcome It and Unlock the Potential in Yourself and Your Organization” by Robert Kegan and Lisa Lahey. This book is a comprehensive resource to anyone who is interested in the Adult Development theory and how it underpins Immunity to Change, how Immunity to Change plays out in organizations, and seeing workplace examples of overcoming Immunity to Change. 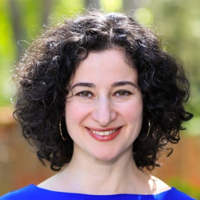 Susanna Katsman is an organizational development practitioner specializing in experiential curriculum design and facilitation that unlocks the potential for transformational learning -- whether it be through a custom tailored intact team engagement, Leadership Development Training, an online course, or Peer Coaching Program. Susanna has been passionate about adult learning and organizational development for many years. She has followed this passion by pursuing an Ed.M. in Human Development and Psychology at the Harvard Graduate School of Education and a certification in Immunity to Change facilitation from Minds at Work. Susanna is continuously honored and humbled by witnessing participants in her programs wrestle with their challenges and come out on the other side with a changed mindset that enables them to move forward with greater clarity, perspective, and confidence. Susanna has held a variety of roles within Organizational and Workforce Initiatives realm, currently overseeing Training & Development and Work-Life-Wellbeing functions on the Harvard Longwood Campus. Topic: Behold - Immunity to Change system!